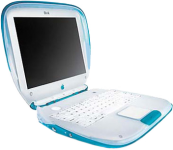 iBook by Apple was designed to target beginners and educationists with its economical price and simpler specifications. Its fun shape, bright colors, and durability made it very popular when it was first released. Your iBook's performance can be increased with a simple upgrade.